Aeration Basin Upgrade – KC Engineering and Land Surveying, P.C. KC provided consulting services for the engineering design, NYSDEC permitting, engineer’s reports, preparation of contract documents, construction inspection and management during construction, and support services during startup and operation. Settleable Solids: 0.1ml/L daily max. 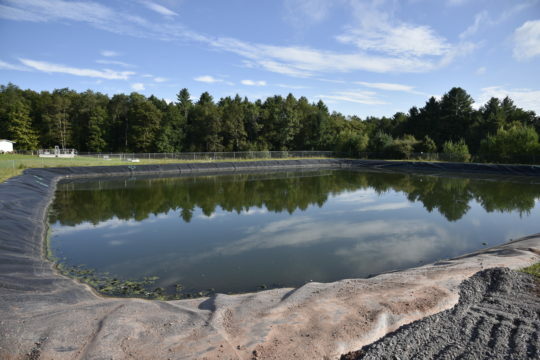 The Kauneonga Lake Sewer District (KLSD) Wastewater Treatment Plant uses two aerated lagoons to provide biological treatment for up to 0.6 MGD of sewage. The floating aerators provide both the oxygen required for the biological process as well as mixing of the lagoons. KC worked with the plant operators and NYSDEC to specify replacement aerators for rehabilitation of the basin. While replacing the aerators, the basin was drained, all solids were removed, and the liner was inspected and repaired as needed. This comprehensive approach will allow for operation of the basin for another 20 years.